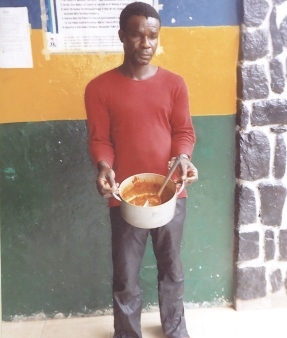 Daniel, a resident of Ajegunle was accused by the neighbour, Mrs. Saidat Shakiru of putting insecticide in a pot of soup she was cooking on Tuesday. It was gathered the woman had left her soup pot on the fire to attend to another issue only to return and discover that the soup reeked of sniper, a poisonous liquid insecticide. The woman was said to have accused Daniel who was the only resident of the compound at home when she was cooking. She was said to have alerted the landlady who resides on the topmost floor of the storey building as well as her husband who was at work before the matter was reported to the Baale of Aiyetoro street, Saheed Fakunle. “Sadiat and the suspect were at home when she was cooking the soup. The woman allegedly went outside to buy something and before she came back Daniel had doused sniper into the soup she was cooking. “When the woman opened the soup pot she perceived an offensive odour from the soup and she sensed foul play. The angry woman drew the attention of the landlady to what she had observed. “Her landlady asked whom she suspected. Since there was nobody at home, she accused Daniel of the deed. When her husband, Shakiru returned from work, she explained her predicament about the soup she was cooking and the matter was moved to the Baale. The Nation gathered that the suspect, who blamed his actions on the devil, said he was angry because the woman usually insulted him over electric bill. “The woman has been insulting me over electricity bill. I don’t know what got over me so I decided to put sniper inside their soup to punish her. I am sorry. I regret what I have done. She insulted me so much because of the electricity bill if not I don’t have any problem with her and her husband,” he said. The owner of the house, Taiye Aroyewun frowned at the suspect’s action, calling him a madman. [Video Premiere] : Davido – Skelewu.